Your company may be large or small; well established or just starting out; poised for growth or needing to curb diminishing sales. Whatever your circumstances, let us help you determine how marketing communications can facilitate your efforts and contribute to your success. 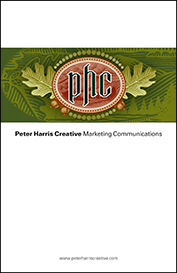 Are you interested in learning more about Peter Harris Creative? Click here to download a PDF version of our booklet (4MB). Peter Harris Creative © 2015. All Rights Reserved.